At the rally organized of the 30th Anniversary of the Union Carbide disaster in Bhopal, five organizations of survivors made an appeal to people all over the world to put pressure on responsible parties to end the disasters in their fourth decade. 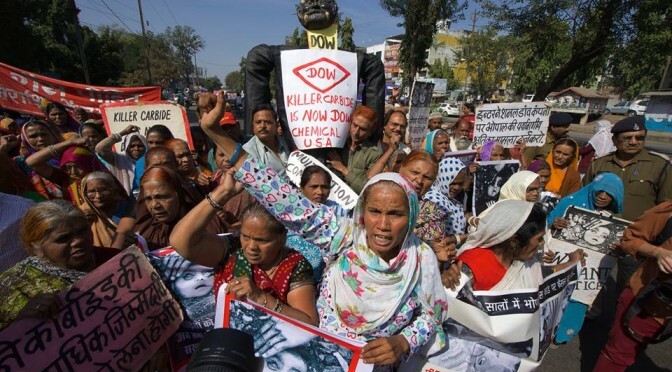 They asked supporters to help make Union Carbide, USA and its 100 % owner Dow Chemical acknowledge their roles in the continuing human suffering in Bhopal and make amends so that a realistic goal of ending the disaster by 2024 can be achieved. Bhopal, Dec.2 (ANI): Leaders of five organisations representing survivors of the Bhopal gas tragedy have called on the United States Government to acknowledge and express regret for financing, through its EXIM Bank, the construction of the hazardously designed Union Carbide plant in Bhopal, Madhya Pradesh, that caused the 1984 tragedy. 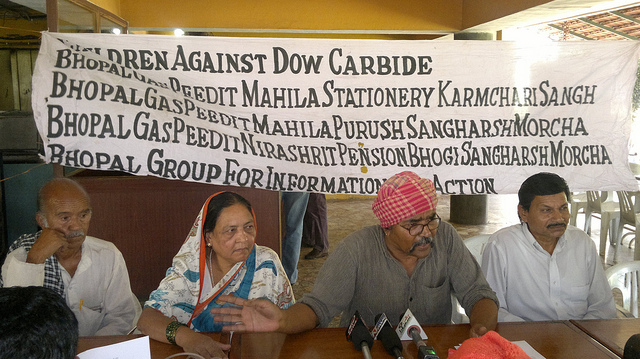 Bhopal: Representatives of five NGOs (non-government organisations) working for the welfare of the survivors of 1984 Bhopal gas tragedy, the world’s worst industrial catastrophe, have accused the Government of India of kowtowing to US Government pressure to serve the interests of Union Carbide and Dow Chemical in Bhopal. Addressing a press conference here on Wednesday the representatives of the NGOs while citing recently released documents from Wikileaks’ “Kissinger Cables” said former Commerce Minister Kamal Nath and Planning Commission Deputy Chairman Montek Singh Ahluwalia welcomed Dow investments in India and contradicted the Government of India’s stated position on Dow’s liabilities in India. Representatives of five NGOs working for the welfare of the survivors of 1984 Bhopal gas tragedy addressing Press Conference. The US Ambassador David Mulford is reported to be urging the Government of India to “drop its claims against Dow” in a cable sent on September 18, 2007. In reply Ahluwalia assures the Ambassador that the Government of India does not hold Dow responsible for the clean-up but is unable to withdraw its claims against Dow because of “active and vocal” NGOs. According to the cable Ahluwalia then advised the Ambassador to discuss the issue of Dow Chemical’s Bhopal liabilities with Finance Minister Chidambaram. The Bhopal organisations said the available cables indicate that the Government of India has consistently short-changed Indians and Bhopalis and served the interests of Union Carbide Corporation. As early as in the 1970s, the Government of India compromised on principles related to foreign exchange to help Union Carbide retain majority control over Union Carbide India Limited (UCIL). The organizations stated that a cable sent by Deputy Chief of Mission David T. Schneider from the US Embassy in New Delhi on February 4, 1975 shows that the Government of India allowed Union Carbide, USA to bypass the Foreign Exchange Regulation Act and obtain loans from American Exim Bank instead of an Indian financing agency. Another cable of September 11, 1975 from US Secretary of State Henry Kissinger to the US Embassy in India shows the support the US government gave to Union Carbide, USA in securing loans from the US Exim Bank for its Bhopal operations. The organizations presented copy of a cable sent by the then US Ambassador in India William Saxbe on April 20, 1976 that expresses satisfaction at the dilution of FERA guidelines so that Union Carbide can continue to hold majority stakes in its Indian subsidiary. The representatives of five organizations – Bhopal Gas Peedit Mahila Stationery Karmchari Sangh, Bhopal Gas Peedit Mahila Purush Sangharsh Morcha, Bhopal Gas Peedit Nirashrit Pensionbhogi Sangharsh Morcha, Children against Dow/Carbide and Bhopal Group for Information & Action stated that the Wikileaks documents highlight the historical roots of the continuing injustice in the case of the world’s worst industrial disaster in Bhopal. They said that the injustice in Bhopal is being perpetuated by the support of the US and Indian government to Union Carbide and Dow Chemical as well as that by traitors such as Kamal Nath, Chidambaram and Ahluwalia. It may be recalled here that on the intervening night of December 2-3, 1984 Union Carbide pesticide manufacturing factory had spewed poisonous Methyl Iso-cyanate gas whereby 3000 people had perished virtually instantly and over the years more than 25000 have kissed death and the sad saga is still continuing uninterruptedly. About half a million are suffering from the side effects of the poisonous gas and several thousand people have been maimed for life. 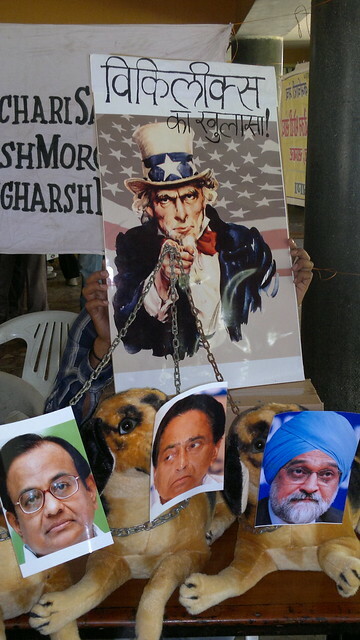 A cartoon on display of Uncle Sam controlling Indian high profile leaders and officials at the venue of Press Conference. Extract: We are trying to take advantage of the opening provided by Kaul’s interest in solving economic problems by asking for finance action to resolve a large variety of problems such as the fertilizer arbitration case, remittance delays, Pan Am and TWA problems and pending investment proposals such as Union Carbide and national starch as well as an easing of the more onerous FERA guidelines. (as this cable was being prepared union carbide telephoned to say that its proposal had been suddenly approved after 6 months of waiting.) we hope to get more results. The “success stories” so far relate to GOI movement on the north Vietnam problem, a noticeable easing of “fly Indian” restrictions on Indians travelling on USG programs and union carbide. Extract: The Export-Import Bank of the United States has authorized a direct credit of dol1,260,000 to Union Carbide India Limited (UCIL), to support a dol2.8 million sale of US equipment and services required for the construction of a plant to produce insecticides and other agricultural chemicals. The plant will be built at Bhopal, Madhya Pradesh, for the production of methyl-isocyanate based pesticides. us purchases will include reactors, distillation towers, heat unclassified un-classified page 02 state 001679 exchangers, centrifuges, filters, dryers, valves, control instrumentation, safety equipment. us suppliers will include Vulcan manufacturing company of Cincinnati, Ohio, and Gould pumps inc., of Seneca fall, New York, among others. Extract: During the CEO Forum event in October 2006, GOI officials including Commerce Minister Nath and Planning Commission Deputy Chairman Montek Singh Ahluwalia stated that they welcomed further Dow investment in India and did not believe that Dow was responsible for the disaster site clean-up. Extract: The Ambassador also cited the GOI’s continued third party claims against Dow Chemical in the ongoing Bhopal land reclamation lawsuit as a further impediment by Dow and others to invest in India, and he asked that the GOI drop its claims against Dow. Ahluwalia took the Ambassador’s points on McDermott, noting the importance of finally putting the issue to rest. On Dow, he said that the GOI does not understand Dow’s concern about future civil or criminal liability since the GOI third-party claims do not suggest a GOI presumption that Dow is responsible for the cleanup. 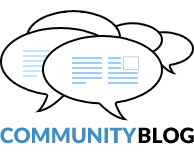 In 2009 and 2012 NDTV aired multiple video segments related to the Bhopal disaster and ICJB. Below is a list of all known segments, available to stream via NDTV.com. Also included is one segment on industrial pollution in South India (Cuddalore, Tamil Nadu).